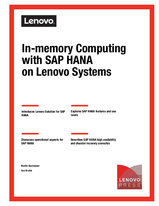 The fifth edition of this Lenovo Press publication describes in-memory computing appliances from Lenovo and SAP that are based on Lenovo flagship systems and SAP HANA. It covers the basic principles of in-memory computing, describes the Lenovo offerings, and explains the corresponding SAP HANA IT landscapes using these offerings. This book also describes the architecture and components of the Lenovo Solution for SAP HANA, with IBM Spectrum Scale as a cornerstone. The SAP HANA operational disciplines are explained in detail: Scalability options, high availability and disaster recovery, backup and restore, and virtualization possibilities for SAP HANA appliances. This book is intended for SAP administrators and technical solution architects. It is also for Lenovo Business Partners and Lenovo employees who want to know more about the SAP HANA offering and other available Lenovo solutions for SAP clients. Note: This book is a draft and has not yet been reviewed by the editor.